'THE LAST COLD CASE' part one! The two greatest detectives in the DC Universe take on the one cold case that will tear them apart! As chief architect of the Sanctuary program that cost so much for so many, especially Wally West, Batman will be held accountable…by the Flash! A cold case from the Justice League's past has mysteriously re-opened, and Batman and the Flash-the only two heroes who stand a chance of cracking the case-are at each other's throats! 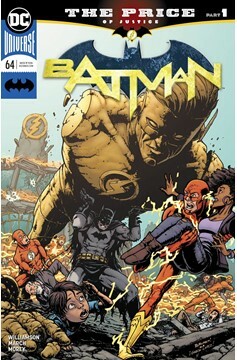 Our heroes must combat a demon from the past while burying their own inner demons in the process…and neither the World's Greatest Detective nor the Fastest Man Alive will ever be the same again! But who is really pulling the strings here? And how does Gotham Girl fit into all this? Friendships will be tested and blood will be spilled in this titanic crossover event… RATED T+.